Brooks B17 in Honey or Brown. Note to city dwellers: these things get stolen unless cable locked. 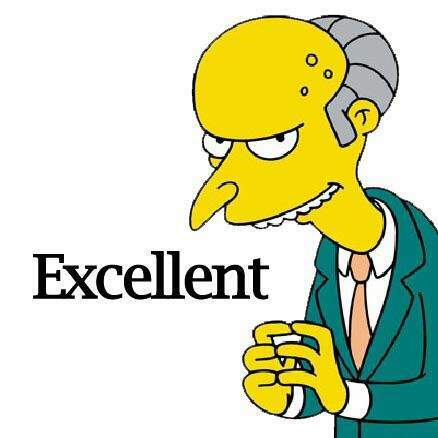 May as well buy from Amazon Smile and chisel Mr Bezos out of a little of his billions. Voted. A thing of beauty. Until bum meets leather then it gets a bit nasty. I wish everyone owned one of these. I love the smell of leather. I'm 66 - people tell me it's too late for me to break one in! I've always been tempted to try a Brooks....... but the theft issue stops me splurging out the crazy price for one. A terrific price and a surprisingly comfortable saddle. Have been using one for several years on my hybrid bike. Use it for my daily commute and for longer leisure rides. No “ill effects” even after rides lasting several hours, not something I can say when I've used other saddles. In my opinion, the most comfortable saddle I’ve ever owned. Cold. Thought it was a T-bone steak. Ha. I'm 66 - people tell me it's too late for me to break one in!Are they very …I'm 66 - people tell me it's too late for me to break one in!Are they very heavy?Found it: 460gm. Buy it for me, I'll break it in for you and leave it to you in my will. Brooks will repair an out of warranty saddle for a fee. Brooks don't approve of this though. FWIW. For those that want a black B17, Wiggle have them for 59.38, add something for a quid on top to bring the order over 60 pounds and then apply the 10 pounds discount code 'NEWGB' (new accounts only) at the checkout to get a tenner off. 3.99 pounds postage. Halfords got the black in at £59, but down to about £54 if I have the British cycling discount. There's a cheaper clone of the b17 available that had good reviews. I bought one, and after 1000+ miles it shows little sign of breaking in. I was wary of getting another Brooks, breaking it in and having it stolen again. Googling around, there are many methods of breaking in saddles, varying from 'just ride it' to soaking in hot water and applying mink oil, to soaking in 10w30 engine oil(!). 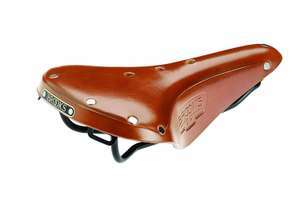 I may go nuclear on the Spa cycles saddle and see if it responds to the hot water and mink oil approach this summer.